That’s one way to make it to Indianapolis. Relying on their defense to overcome an uncharacteristic performance from Tom Brady, New England held on for a 23-20 stomach-cramp win. With two weeks until the big game, this column will be more devoted to the AFC Championship than to Destiny in Indy (which may or may not be the title of an adult film). So put off tolerating highlights of a certain previous Super Bowl and bask in the glory of New England’s fifth AFC win since January 2001. 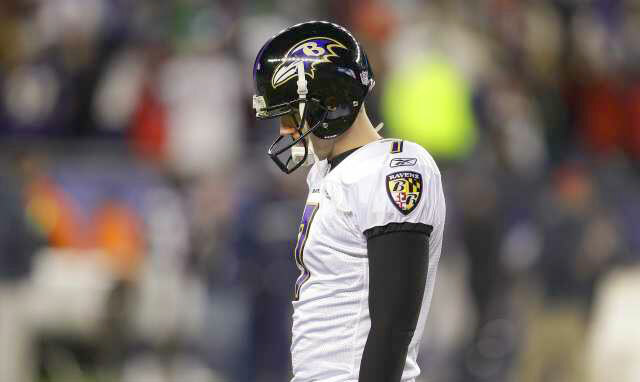 Billy, Don’t Be A Hero: Despite our rooting interest, we must feel some sympathy for Billy Cundiff, the Ravens kicker who failed at his job at the least opportune time possible. Just a tough way to go. A welcome way for Pats fans, sure, but still tough. Stagger, Lee: Similar sympathy (and/or ironic thanks) to Lee Evans, who allowed Patriot defensive back Sterling Moore to knock a winning touchdown pass out of his hands. The lesson? To paraphrase Mike Vrabel when he was asked about catching a touchdown pass vs. Carolina, hold onto that ball like it’s your newborn son. Hold The Rice: After watching what must have seemed like a continuous loop of Ray Rice running for an 83-yard touchdown back in the 2009 playoffs, New England set out to stop the dynamo and did so, holding him to 67 yards in 21 carries for 3.2 yards per. For a defense that had some trouble stopping the run in the regular season, the past two playoff games have seen a welcome change. Kraft Work: Kudos to BenJarvus Green-Ellis, not just for his steady day toting the spheroid (15 for 68 yards, 4.5 per), but for his thoughtful touch to the MHK patch on his uniform. Good to see the team honoring the late Mrs. Myra Kraft this year. Lest we forget, the 5-3 Patriots headed down to New York (well, New Jersey, but close) to take on the Jets in a fight for first place in the AFC East. They beat the Jets by three TDs and have won every game since. We’ll take it. Where There’s A Wilfork, There’s A Way: The AFC Championship win came in no small part to the efforts of defensive lineman/bulwark Vince Wilfork, who finished with six tackles and one sack and seemed to make an impact on every other play. A great game for the big fella. He went against solid center Matt Birk, but too often seemed like he was in the back corner of the playground taking Birk’s lunch money. How’s The Grankle? Tight end/Beanstalk resident Rob Gronkowski had his ankle twisted during a tackle by safety Bernard Pollard, a name so odious to New Englanders he’s approaching Bucky Bleeping Dent territory. No matter what, Gronk’s playing. Let’s hope he helps the good guys triumph.